The present discussion on the potential collaboration between religion and human rights has attracted some interesting articles on how religion and religious actors can complement, or undermine, human rights causes. Larry Cox has written how religious ideals of social justice provided an impetus and legitimacy to human rights causes, while Nida Kirmani wrote about how religion provided inspiration and legitimacy to gross violations of human rights. Advocates of collaboration tend to focus on the behavior and actions of some religious leaders or religion-inspired human rights, while skeptics focus on the potential dangers of the collaboration to vulnerable groups, such as women, minority groups and the LGBT community. While religion and human rights may converge on boarder principles, their application in specific circumstances can and do diverge. These differences call for a selective and limited use of religion in the human rights movement. While religion and human rights may converge on boarder principles, their application in specific circumstances can and do diverge. A good example is the reproductive rights of women or the rights of sexual minorities. These differences call for a selective and limited use of religion in the human rights movement. Where there is a common ground on certain issues, human rights activists must work with religious leaders, and use their acceptance and credibility to advance those causes. On the other hand, when religious leaders promote ideas and practices that contradict essential elements of human rights, activists must confront and challenge the narratives and arguments of such leaders. Activists may even work with moderate religious leaders to undermine the views and actions of regressive religious leaders. An approach that does not absolutely preclude religion, or blindly endorse religion as a matter of principle, is preferable. The value and utility of the partnership should be assessed on a case-by-case and pragmatic basis. Just like many human rights activists work with traditional communities and their leaders, they must work with religious communities to advance the cause of human rights. To ignore such an influential and resourceful notion as religion is unwise. In many countries, especially countries with dominant Muslim populations, one has to recognize the influence of religion and religious law. However, the articles published here do not sufficiently explore how a state can balance the demands for official recognition of religion with the demands of human rights. They do not talk about how in some countries political leaders try to accommodate the demands of religion within the notion of human rights. Given the social, cultural and religious reality in some states, excluding religion and religious law is not only unwise but also impractical. However, states should be pragmatic in recognizing certain aspects of religious law. They will need to recognize the broad principles and objects of a particular religion, or religions, and at the same time find a way to guarantee fundamental human rights. For instance, the 2014 Constitution of Tunisia and the 2012 Provisional Constitution of Somalia expressly recognize Islam as a state religion and its potential role in shaping laws and state action. Nevertheless, the constitutions do not allow religious leaders to invalidate laws based on real or perceived incompatibilities with Islam. Moreover, the constitutions recognize a number of rights and establish procedures and institutions to enforce such rights. In both countries, the extent to which religious ideals and principles will influence (both positively and negatively) the recognition of human rights depends on the political realities of the time and the views of the dominant political forces. Nevertheless, the establishment of clear procedures for the enforcement of rights is likely to ensure that human rights have a certain level of protection. 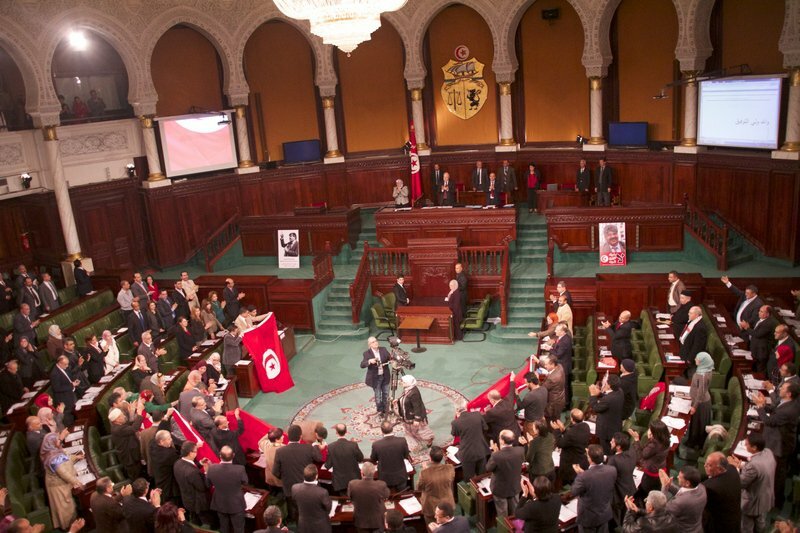 Members of the Constituent Assembly of Tunisia celebrate the passage of their country's new constitution. Furthermore, the recognition of the application of religious law may counter-intuitively advance human rights, as it gives the state the opportunity to set up constraints and control mechanisms within the system. For instance, the constitutions of some states, such as the Constitution of the Federal Democratic Republic of Ethiopia, establish or allow Muslims to establish Shari’ah courts that resolve disputes between Muslims, provided all parties to the case have consented to the jurisdiction of the court. This ensures that only those people who agree to the system will be subject to the law. In the absence of such recognition, women and other vulnerable groups are likely to be socially forced to be subject to the system. Ignoring Muslim personal law does not necessarily mean religious law will not regulate behavior anymore. It only means the system will operate outside the framework of the state, which makes it difficult to tell whether women and other vulnerable groups are being treated well and deprives the state the opportunity to correct at least the most egregious consequences of the application of religious law. While principles are an important consideration in forging a partnership between religion and human rights, the diversity and contradictions on the ground require a more practical approach. In fact, a number of grassroots human rights organizations already actively collaborate and work with religions establishments and leaders. A sensible approach would be to assess the partnership on a case-by-case basis.